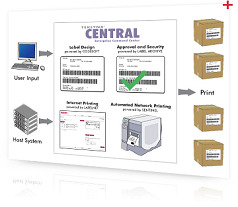 Teklynx Central - Integrated Label software system! TEKLYNX CENTRAL combines the proven technology of Teklynx barcode design, printing, and label tracking and approval software into a single solution that supports your manufacturing environment. Teklynx Central is a single integrated label software system designed specifically to help you meet industry specifications. It can significantly increase efficiency in your manufacturing operations. Hosted label printing for supplier networks. By enabling out-of-network printing, local printing features allow you to ensure suppliers and/or vendors to print your internally approved labels. Integrated applications eliminate compatibility issues. The proven label software solutions provided by Teklynx are designed to work together. A controlled environment provides the security you need to ensure accuracy. Centralized controls help system administrators coordinate licensing.